It is replaced by the Intermec IP30. 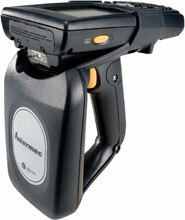 The IP4, an accessory handle for attachment to the popular Intermec 700 Series Color mobile computers combines the power of a handheld mobile computing device equipped with Bluetooth, LAN and WAN radios as well as a multi-protocol RFID radio that can be used worldwide. Users of the 700 Series Color mobile computers have posted productivity gains and enjoyed application flexibility enabled by the three radios - Bluetooth, local area (LAN) and wide area (WAN) - as well as the area and linear imagers integrated into the handheld device. Combining those capabilities with the IP4 and the strength of the Microsoft Pocket PC platform gives users a high performance mobile RFID solution.